Having produced this piece I realise that I need to practice more if I want to continue mono-printing! 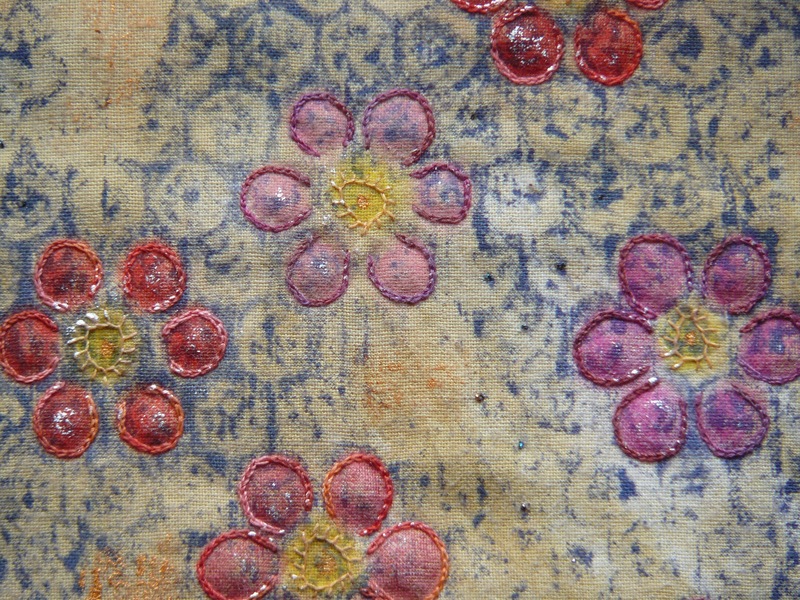 I started off with some cotton fabric which was dyed with pomegranates, it was then mono-printed with Procion dyes. Using the shapes that the impression had created I coloured in flowers which I then chain stitched, the grasses are screen printed at the bottom, I can almost see them on the edge of a pond. I found this a very hard exercise because my powers of imagination failed to work at the printing stage and I was unable to create the usual ‘story’ around the piece. It is however a midnight garden with plenty of moonlight and dew drops creating a sparkle, I have used very small stitches and sparkly thread to quilt randomly to hold the layers together where there aren’t any flowers. I have then added wax in places to produce a bit of a sheen. The result of my efforts is more abstract than normal and probably more coloured, but, because there is no real story in my head to accompany the quilt, I feel that it is very shallow although I am relatively happy with the result. The flowers and grass are beautiful. The hand stitching really enhances the flowers and makes them stand out. The grasses have a delicate quality and one can feel the breeze blowing through them. The piece is very effective even if it does not “tell a story.” It is a delicate and effective work of art. 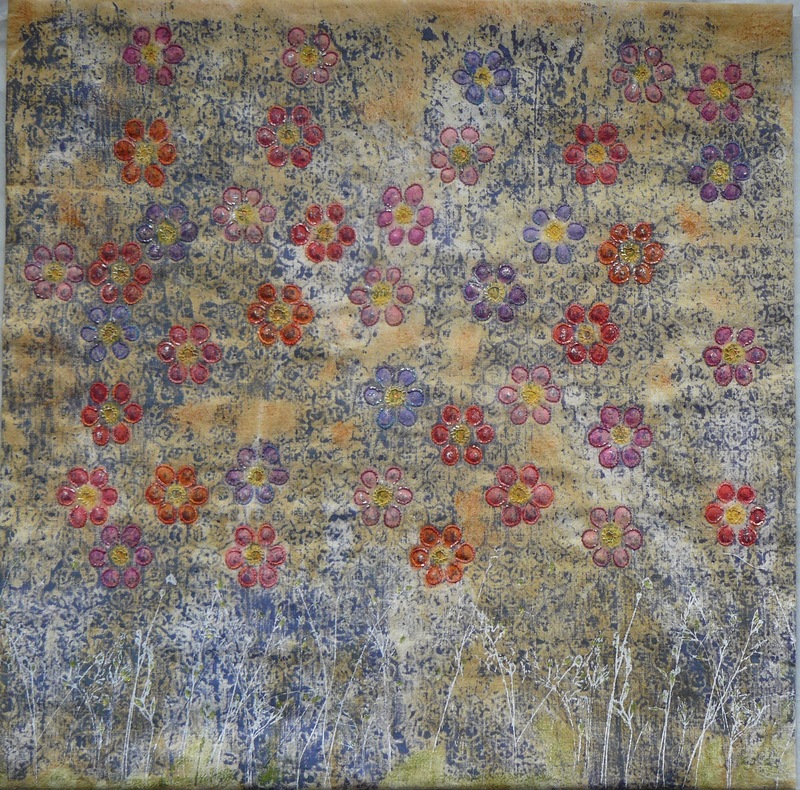 It reminds me of an impressionistic flower garden. I found it interesting that you juxtaposed two types of printing onto the fabric: screen printing and mono-printing. I like the subtle colours, and the delicate aspect of the grass. Looking at it in a distance, it looks like a painting. I like it. Repeating the design make site very interesting. Lovely little flowers and very fine grass at the bottom. Don’t mind that you have no story with it. Now can we use our own imagination on it…. This is such a happy piece. I love the flowers and the sparkle of the dewdrops. What kind of wax did you use? Acrylic wax? I love the little flowers and the dainty chain stitching. I’ll make up my own story for this pretty little quilt. The colors and the handquilting is really beautiful. Very nice!